Somewhat surprisingly, Hannover made life really difficult for their visitors RB Leipzig in the first half, despite the huge difference between the two teams in the Bundesliga table. 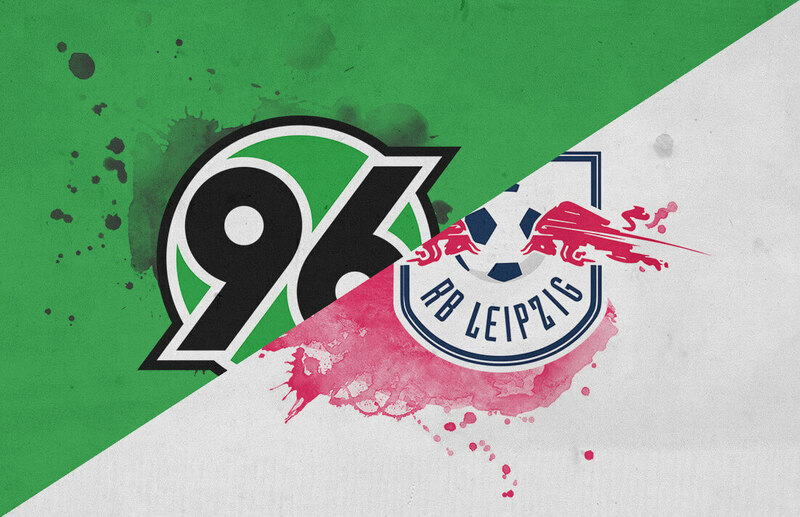 However, with a late, late goal and two others in the second half, Leipzig came out on top. This analysis will reveal the crucial tactical elements of this clash. After their great victory in Düsseldorf, this weekend Leipzig had another away game. The visitors employed a 4-4-2 formation where Diego Demme and new arrival Tyler Adams formed a double pivot. 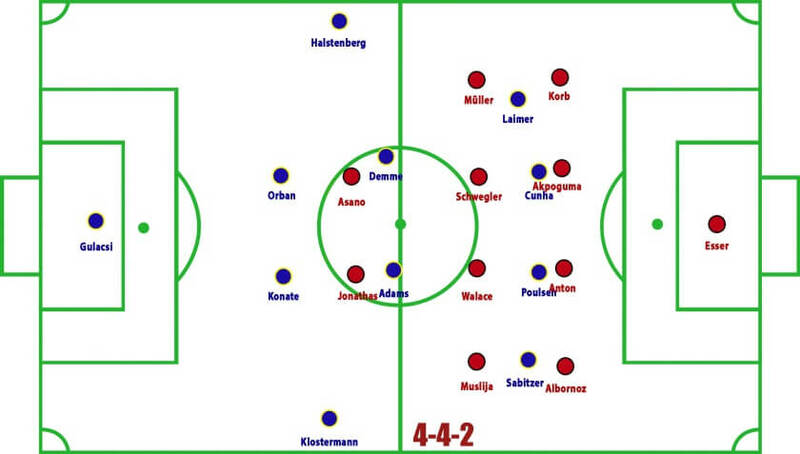 On the other side, Hannover went for a 4-2-3-1 formation in which foreshadowing played a reactionary role. Hannover approached this game with a cautious manner which materialised in a 4-4-2 against the ball. 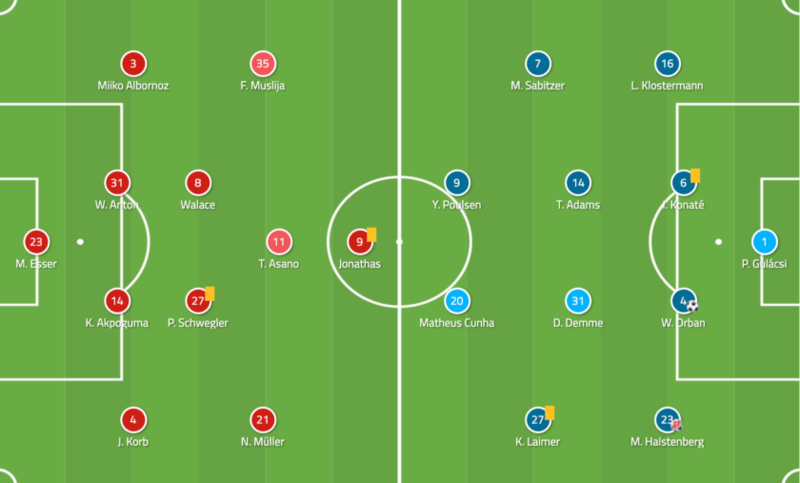 Takuma Asano joined Jonathas to form the first line of pressing which aimed to block the middle area, while Nicolai Muller and Florent Muslija dropped beside Pirmin Schwegler and Walace. Hannover thus created a midfield press which aimed to deny the opposition’s progression. 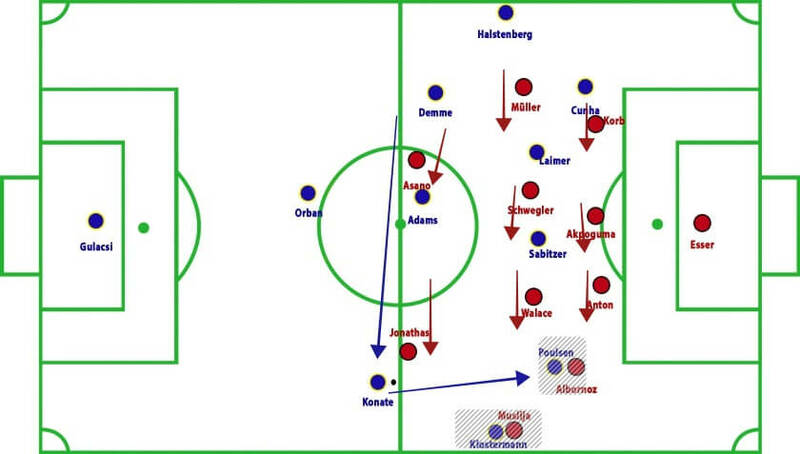 Hannover were vertically compact as the lines stayed fairly close, especially the first and second lines. When it came to their mid-block, first line of press stayed around the halfway line and narrow. When the ball moved wide, the near-side forward shifted to the wing in order to press the man in possession. 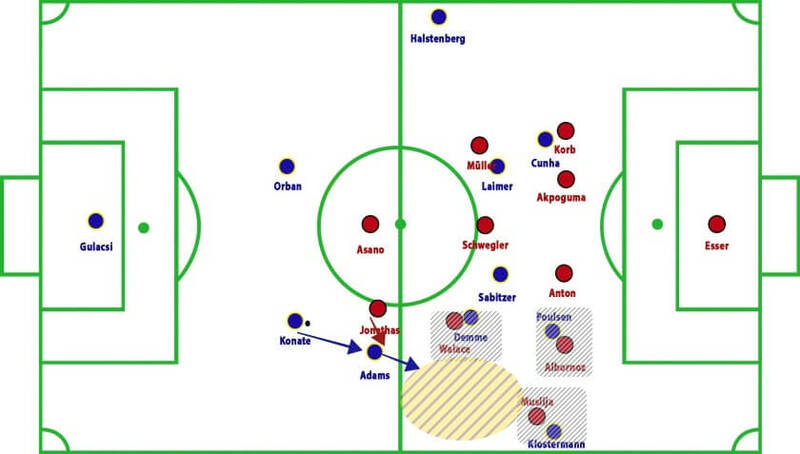 This worked very well since Leipzig were not able to create quality scoring opportunity in the first half, and also had some issues with build-up. Unfortunately, the penalty came the worst possible time for Hannover. They were also unable to generate a real threat on the opponent’s goal. Their plan was to use counter-attacks for chance creation. As a result, their play was not combination heavy but rather a direct style. Only a few quick one-twos occurred in their play. 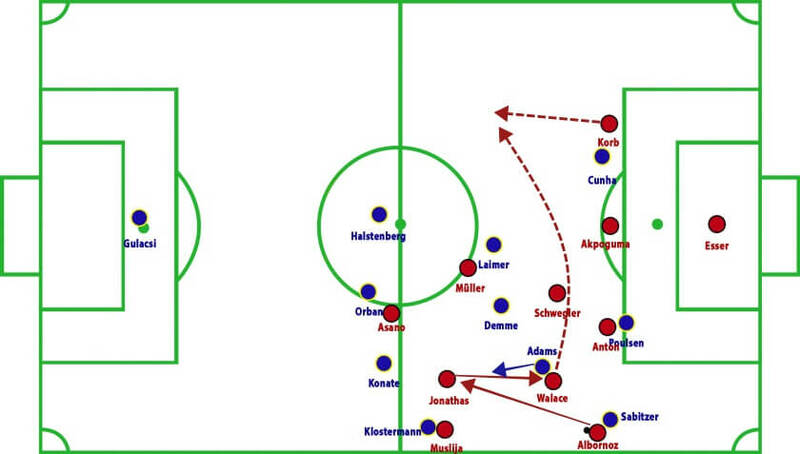 With the ball, the visitors formed their customary 4-2-2-2 where the wingers and strikers stayed narrow. Only the full-backs provided width. 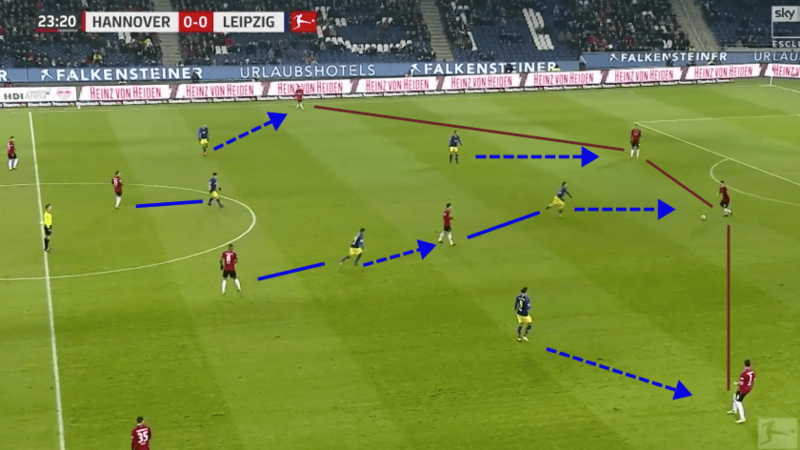 One of the major concepts in Leipzig’s build-up is to create a situational back three by using one central midfielder wide in order to generate stable build-up against the opposition press. In addition, it allows the full-backs to occupy higher areas so the wingers can stay narrow. The aim for Ragnick’s man was to create combinations in between the full-back and winger in high areas. However, this combination had to perform in between the opponent’s near-side full-back, winger and the near-side central midfielder. This left Hannover with numerically superior situations. Adams and Demme were tasked with dropping into the last line. In this situation, Adams dropped deep. In the search for space to progress, Leipzig attempted to utilise the half-spaces. However, Hannover’s good pressing movement did not allow it. Adams faced with Walace’s diagonal press. Walace’s cover shadow prevented the pass to the vacated space where Sabitzer dropped. 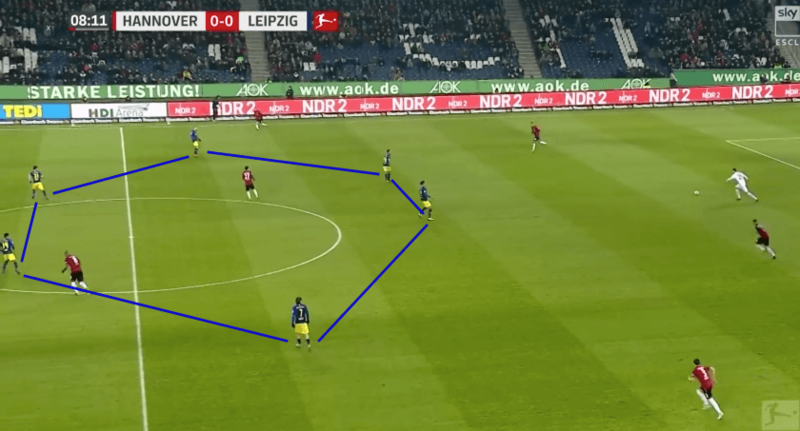 Right after this failed progression, Leipzig found a way to penetrate the opposition defensive structure. Using high full-backs and one more player in the opposition second line attracted Hannover to man-mark. This stretched their line, therefore creating an open gap in the half-space between the central-midfielder and the winger. Demme was marked by Walace and therefore could not move out to press like a few seconds earlier. Only Jonathas pressed Adams on the ball with a curved run. Then Yussuf Poulsen dropped to lay the ball off towards Klostermann, who ran in behind Hannover’s last line. Adams advances on the ball, attracting the pressure from Muslija as Klostermann becomes free. 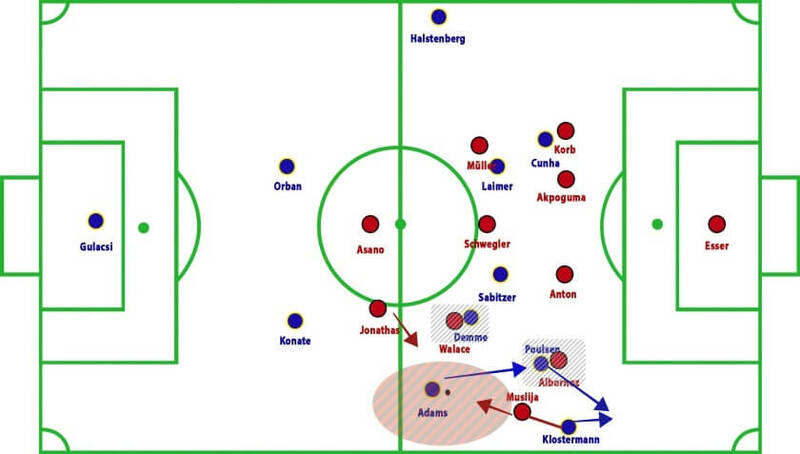 Another tool for Leipzig to exploit Hannover’s defence was to use the momentum of shifting to find open passing channels. 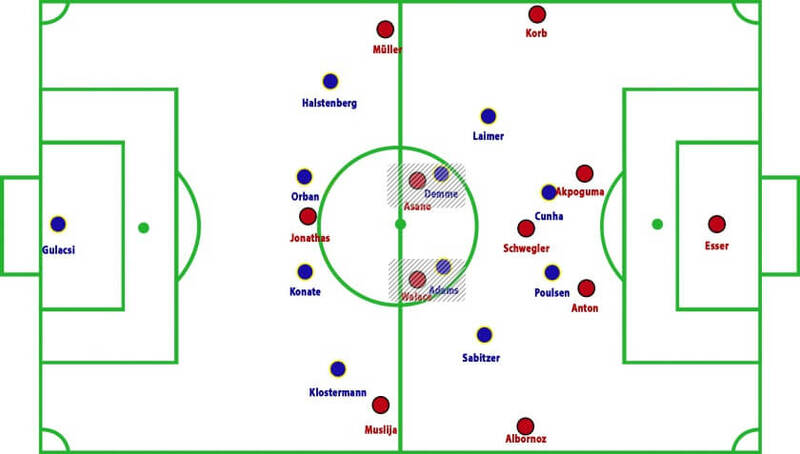 By overloading the left wing, Ragnick’s side were able to pulling the oppositional shape to one side. Notice Sabitzer’s positioning. He usually plays in the right half-space but this time he also moved to the left. 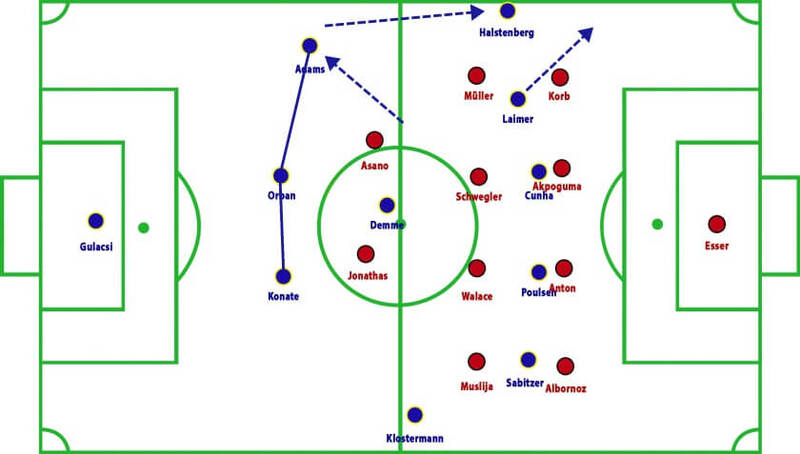 Since Leipzig could not break through, even though they overloaded the left wing, they switched play before exploiting Hannover’s shifting movement with a vertical pass towards Poulsen. However, without proper support, Leipzig could not take advantage of it. Leipzig’s formation during the press is also worth a look. In those situations when they try to prevent opposition progression, their formation fluctuated between 4-2-2-2 and 4-4-2. This set-up aimed to block the middle and thus invite Hannover to play in the lateral zones. Leipzig’s narrow front line. Cunha and Poulsen press the respective centre-backs, whilst the wingers focus on the opposite full-backs. The pressing started when the opponent’s centre-back advanced on the ball. 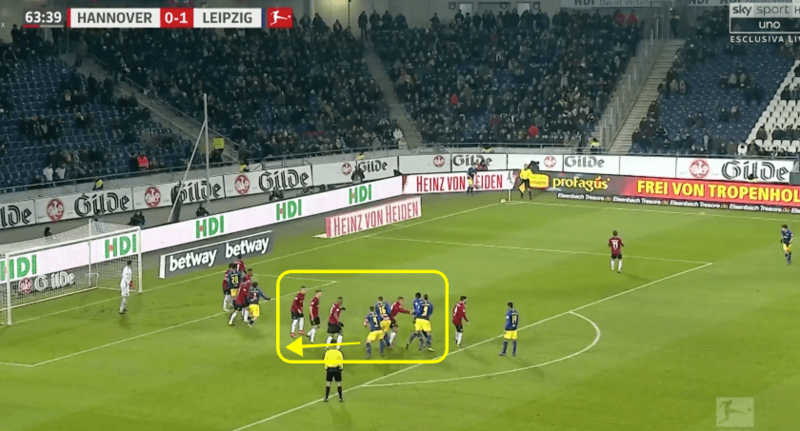 Alternatively, a pass between the centre-backs could trigger Leipzig’s press. Therefore when Poulsen left Schwegler open to move out and press, Adams pushed forward to cover the deepest midfielder. Hannover mostly attack from recoveries or open play but they show a few good combinations. Here is one of them. The guests forced the home side to the wing where they could trap them. However, with Jonathas dropping, Hannover had an extra man deep. A quick one-two in between him and Walace and then a long ball out wide exploited Leipzig. Leipzig were compact close to the ball. Sabitzer pressed Albornoz who was on the ball. 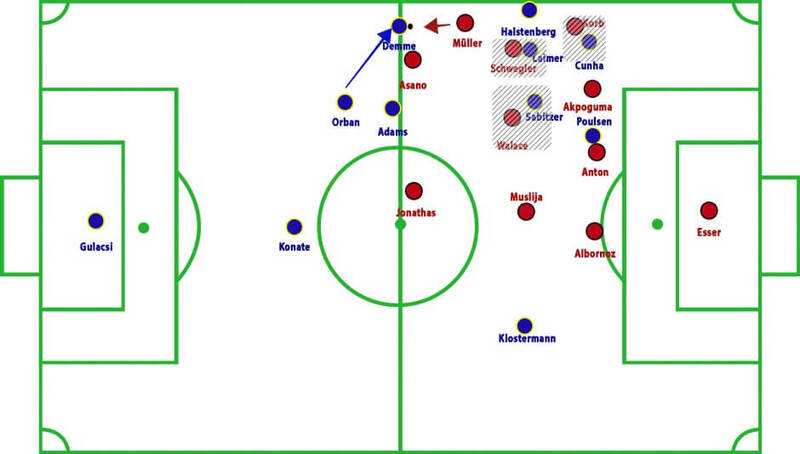 Poulsen marked the nearby centre-back, while Klostermann covered Muslija. After the break, the game changed. Due to the goal at the very end of the first half, Hannover had to step up and play more offensively. The play became something like a transition game since both sides tried to play with a direct, vertical manner. Thus there were often changes in possession. There were often duels in the midfield zone, especially aerial duels. As the recoveries maps shows below, Leipzig won more of these duels (55%) than Hannover (30%). However, the goals scored by Willi Orban came from corner situations. On both occasions Hannover failed to mark him. For the first one, Hannover did not mark the opponents properly before the ball came in. When it did, they had to man-mark at speed which is a much more difficult task. Their attention had to be split between tracking the opponent and the ball too. It was no surprise that Orban could score freely. For the second, Orban was marked properly but with an quick and early movement he could make the separation and arrive in the box to score. Hannover’s situation becomes very difficult with four losses in their last five games. They have dropped into last place of the Bundesliga table. If Thomas Doll’s men do not improve in near future, they will certainly be relegated to the second division at the end of the season. Meanwhile RB Leipzig still have a chance to move further up the table. However, with the defeats against Bayern Munchen and Dortmund, the task becomes harder.